The glove below is my daughter's... it's a tradition in our family for the kids to get a custom glove when they get old enough to pick a size and stick with it (without outgrowing it immediately). As you can see, she chose purple and green. Very cool looking Ichiro Web if you ask me. It turns heads, her teammates are constantly asking about it, and having your name embroidered on your glove is as good as it gets when you're young. It's a 12 inch. 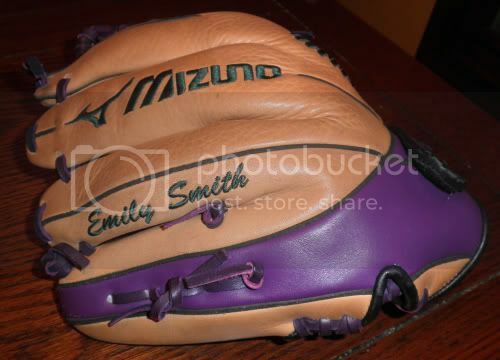 The writst strap comes standard on the Mizuno Custom Fastpitch Gloves, as does the notch near the pinky/heel. There is also a "fastpitch" logo on the back, thumb area, near the base of the thumb. Small, round. You can see it partially. Very awesome. I have a little girl that's 2yo and she loves to practice with her brother; so some day, hopefully I can refer back to this post as refence.